Scoop the ice cream into the mason jar or cocktail glass first, and then pour the black cherry cooler overtop. Garnish with cherries and serve with cute vintage straws. 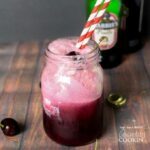 This recipe for Black Cherry Float Cocktail was printed from AmandasCookin.com - https://amandascookin.com/black-cherry-float-cocktail/ and can only be printed for education or personal use.